When our kids get angry their words can really hurt us. It’s hard not to take their hurtful words personally and to not walk into a trap of a power struggle, where both you and your child get angry with each other. It’s important to remember that you cannot control your child’s emotions and words, but you are in charge of your own actions and emotions. You are in control of your responses. And how you respond will affect your child’s behavior. Your child is angry. She trusts you enormously! She knows you won’t reject her no matter what mean words pop out of her mouth. Do not take it personally. It is not the right time to confront her, escalate her anger and potentially invite her physically aggressive behaviors. Most likely you also need to take a moment to process the interaction. Take your time to calm down. Model to your child how to do it. Let your child cool off and calm down in a quiet place. It’s a good idea to let her observe the steps you take when you calm down. When she’s ready to talk, praise her for being a master of her anger. Let her apologize (with words or non-verbally – with hugs and kisses). Do not push her away. If she is open for a hug, give her a hug. Don’t feel rejected if she’s not ready to cuddle, just reassure her that you’d be glad to kiss her when she’s ready. Talk about it with her. We all get angry once in a while, however we want our child to learn that it is Okay to feel angry but it’s important to express anger in an appropriate way. 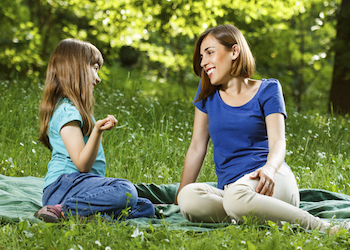 Also, when talking with your child, try not to sound judgmental or angry, otherwise, she will tune you out. Modeling respect is the best way to ensure your child mimics this behavior. Written by Madlena Rozenblyum, LCSW-R. Madlena is a licensed psychotherapist and a parenting expert. She is also a published author, speaker and a passionate believer in the power of positive parenting. Madlena is a principal expert and an author of a new parenting program “Parenting Solutions: Reducing Child’s Anger and Aggression” at Everyday Parenting. This program is based on the principals of positive parenting and will help you achieve successful results in as little as 4 weeks! Get the results you’ve been looking for, START you risk-free trial now! Thanks for your comment. We appreciate your response. Your comment is awaiting moderation.